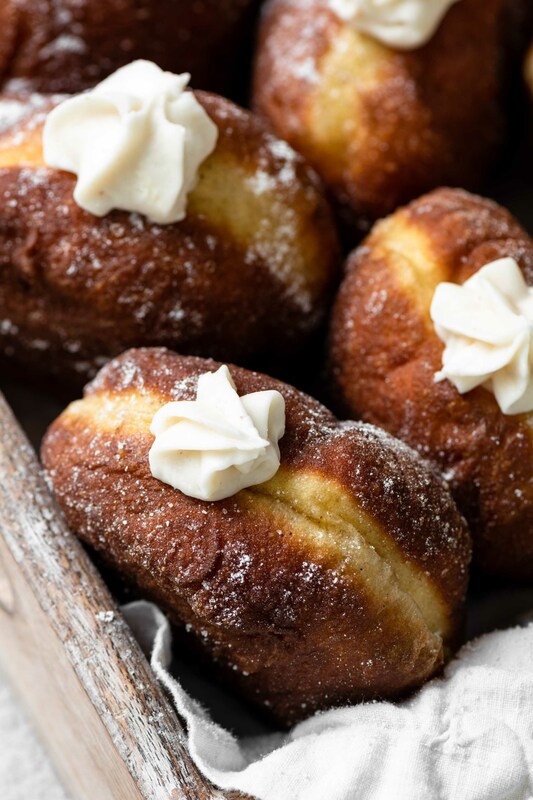 Apple Pie Cream Filled Pumpkin Doughnuts have three components, dough, apple pie filling, and cream. I prefer to make both the dough and the apple pie filling the night before. The doughnut dough does ( say ‘doughnut dough does’ 3 times fast!) well with a slow cold rise in the fridge. Plus having your apple pie filling cooked and chilled makes everything go faster the next day. I prefer to make my cream filling while my doughnuts are cooling. Chop your butter into small cubes and set aside before you start. Use the dough hook attachment with a stand mixer. Once your dough begins to take shape, slowly add you butter cubes in a couple at a time. The dough should grab and mix in the butter. If your dough is too wet then slowly add an extra Tbsp of flour at a time. No more than 3. The dough she be wet and tacky, but not overly sticky. Since I incorporated 3 Tbsp of Pumpkin Puree into the mixture for flavor, I found I needed to add 2 Tbsp of flour to balance out the consistency. Place your dough in a lightly floured bowl and cover with plastic wrap. Chill in the fridge for 4-6 hrs until doubled in size. Or leave in the fridge over night. Remove risen dough from bowl and place on lightly floured surface. Punch down excess air. Pat flat with your hands into a 1/2 inch thick rectangle. Cut into 70 g pieces. Weigh your dough pieces to make each one the same. Fold the sides of each piece into the center of itself to create a ball. Roll the ball on the counter to make it smooth. Set the dough balls on a lightly floured parchment paper lined trays, spacing 2 inches apart. Loosely cover the trays with plastic. Let ‘puff’ for two hours for a second prove. Gently remove your dough balls from tray with a slotted spoon or spatula. Make sure not to press or squeeze them, which will deflate their airy shape. Doughnuts should have a light band around the center and be golden brown on top and bottom. Use a thermometer to check temp of oil. Too hot and it will burn the outside of the doughnuts and the center will be raw! Set on paper towels to dry and cool. This recipe makes a good amount of Apple Pie Filling, therefore you will have some leftover. Keep extra in an air tight container in the fridge. 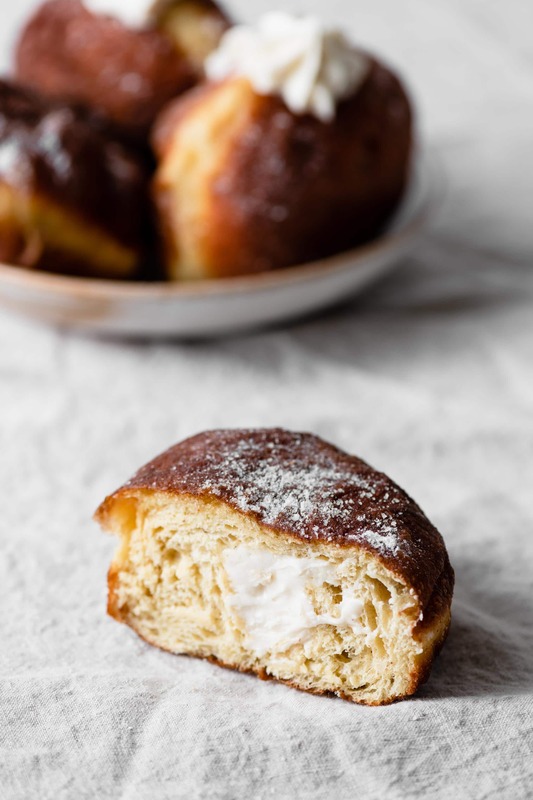 Spoon onto ice cream, yogurt, cereal, or make more pumpkin doughnuts! Try this Surprise Apple Cupcakes Recipe. Substitute your granulated sugar for light brown sugar to get a stronger flavor. Puree your Apple Pie Filling with milk using a blender. Almond milk can be replaced with whole milk. Beat your butter until smooth, I scrape the bottom of the bowl a couple times. When you add the apple pie puree to the butter it may look curdled. Don’t freak out! Keep on mixing and slowly add powdered sugar. Your cream will smooth as you the powdered sugar is incorporated. I like a bit thicker cream for the doughnuts so it holds it shape without oozing back out. Add more puree for thinner cream and more powdered sugar for thicker. Use a skewer to poke a hole in you doughnut. Use a long piping tip. Trim end of plastic piping bag. Place tip into bag and push towards open tip, exposing metal tip. Fill bag with maple vanilla buttercream using a spatula. Twist bag at the larger open end to prevent leaking. Squeeze buttercream towards decorating tip. Keep pressure at thickest part of bag to help frosting pipe more fluidly. Hold doughnut gently in one hand and piping bag in the other. Place tip into skewered hole and squeeze. You should feel the doughnut getting heavier and pressure building onto the tip as doughnut gets full. The pressure should push your tip out of the doughnut. Squeeze a little more for a decorative cream end. 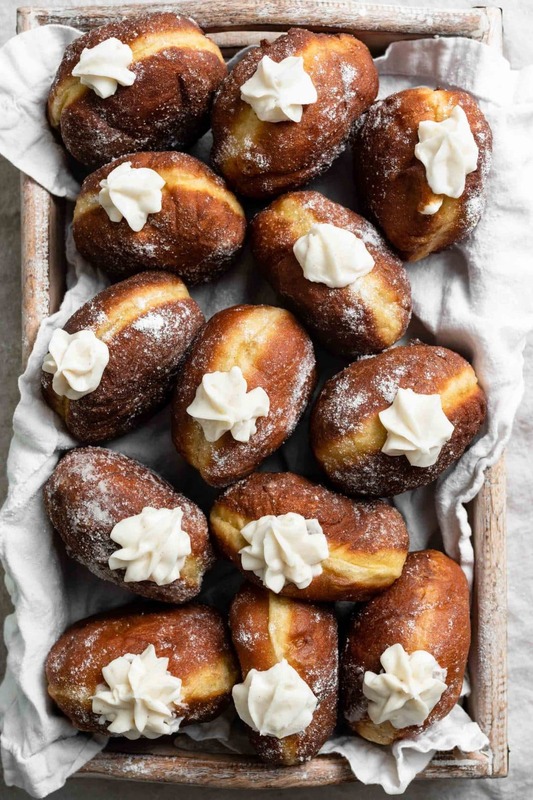 Store pumpkin doughnuts in an air tight container in the fridge to prevent drying out. Refrigerated doughnuts should stay fresh for 3-4 days. 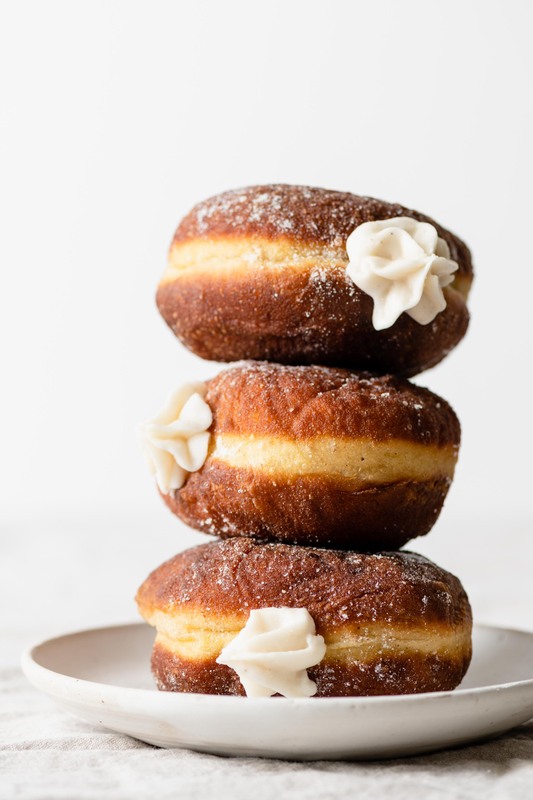 Homemade Pumpkin Doughnuts filled with Apple Pie Cream. Pumpkin Puree and Pumpkin Spiced Dough with a Homemade Apple Pie Pureed Buttercream Filling. In the bowl of a stand mixer, gently stir together with a spoon the yeast, milk and sugar. Let sit until frothy, about 10 minutes. Using a separate bowl whisk together flour, pumpkin spice, and salt. Fit stand mixer with dough hook. On medium speed, slowly spoon flour mixture, eggs, pumpkin puree, and vanilla into yeast. Once dough starts to form, turn up to medium high. Add cubes of butter a few at a time until completely incorporated. Dough should pull away from the sides of the bowl. Dough should be shiny and tacky. If its too wet, simply add a Tbsp of flour at a time, not to exceed 3 Tbsps. Work dough on medium high for 10 minutes and check using Windowpane Test (see above for tips). Place dough in a lightly floured bowl and cover with plastic wrap. Set dough in the fridge to ride for 4-6 hrs until doubled in size or leave overnight. Combine cornstarch and 2 Tbsp of water in a cup stirring until liquid. Continue to stir until bubbly and thick. Place in fridge in an air tight container over night or while dough is proving. Prepare two cookies sheets with lightly floured parchment paper. Remove dough from fridge and set onto lightly floured surface. Cut dough into 70 g pieces. (Use a kitchen scale to make each one even). Fold edges of each piece inward upon itself to create a ball. Roll ball on counter until smooth. Place balls onto cookie sheets 2 inches apart. Loosely cover cookie sheets with plastic bag. Place in warm draft free location for up to 2 hrs until doubled in size. Prepare your oil. Lay out a cooling rack covered in paper towels. Fill a 2 inch deep iron skillet half way with vegetable oil. Heat to 350 F (190 C), use a thermometer! If your oil is too hot it will burn the outside of the doughnuts and leave the inside raw. Gently remove doughnut balls from tray with a slotted spoon or spatula. Careful to prevent misshaping or deflating. Cook 3-4 doughnuts at a time. Place doughnut balls onto oil. They should float with half of each ball submerged. Cook for 3 minutes and flip to cook the other side. Doughnuts should be golden brown on each side with a light ring around the middle. 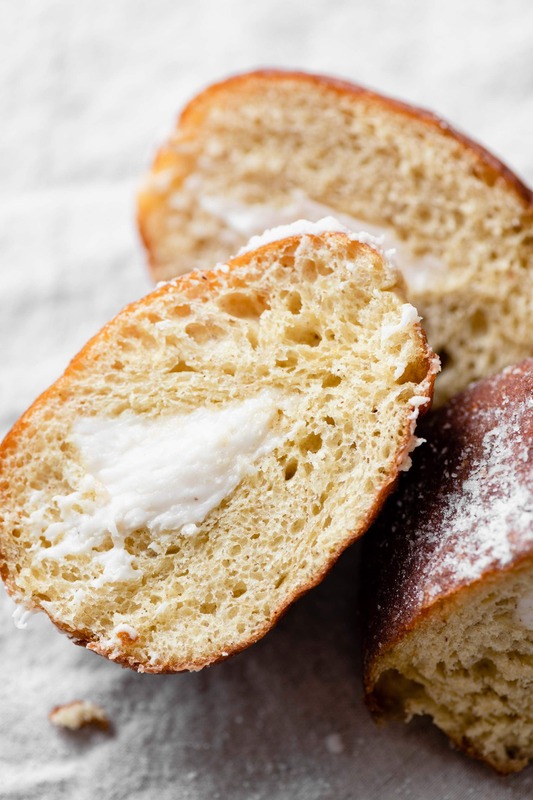 Place cooked doughnuts onto paper towels to absorb excess oil. 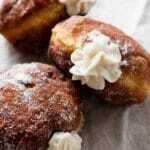 Roll or sprinkle doughnuts with a mixture of 1:1 granulated sugar and powdered sugar if desired. 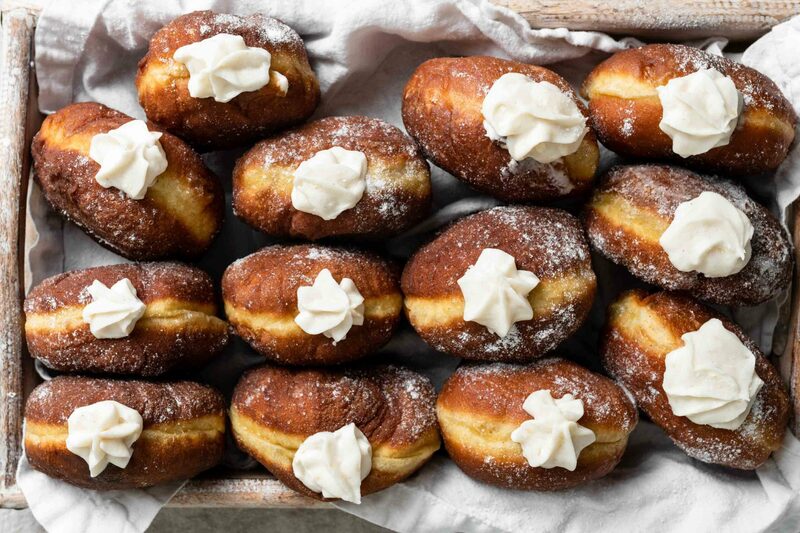 Take a skewer and poke a hole in your doughnuts through to the center. Insert tip of piping bag into hole and fill with buttercream. Squeeze until pressure pushes tip out, leaving a little on the outside for decoration. Blend ½ Cup Apple Pie Filling with ¼ Cup Milk in blender. In bowl of stand mixer with whisk attachment, whip on medium high softened butter until smooth and creamy. Add Apple Pie Puree and continue on medium speed until incorporated. 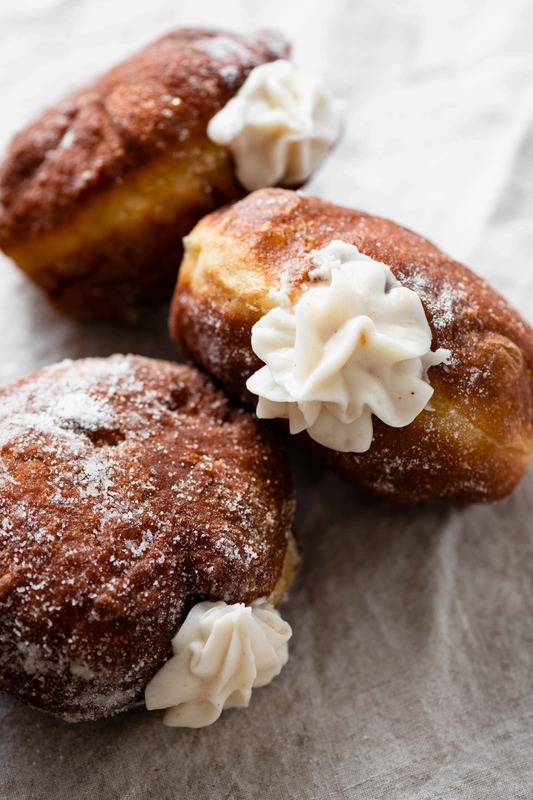 Scoop buttercream into piping bag with desired tip and pipe into doughnuts.